Here is a nice fossil of an Archimedes bryozoan. It was found in Grayson County Kentucky USA. The fossil dates to the Mississippian Period. 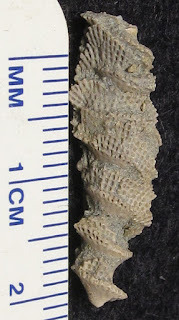 While this type of bryozoan fossil is not too rare, finding one with the screw shape with still attached mesh structure not embedded in matrix is.